Dale Scott has suffered multiple recent injuries. April's was Scott's second game-ending head injury in as many years (more info at: Injury Scout - Dale Scott Removed on Stretcher After Foul), and ever since, his 2017 regular season crewmates of Brian Knight, Jim Reynolds, and Lance Barrett have been without their full-time crew chief. As a respected No. 2 umpire on the crew, Reynolds has served as acting Crew Chief, a position he also occupied in years past as a member of retired umpire John Hirschbeck's crew when Hirschbeck was absent. Yet as the days continue to go by, MLB has had to find umpires to fill the void left by Scott's absence: this goes for both the assignment of acting Crew Chief(s) and for assigning a Triple-A umpire (or multiple call-ups) to fill out the crew. April 14: Scott leaves mid-game due to injury. Reynolds, Knight, and Barrett finish as a crew of three. 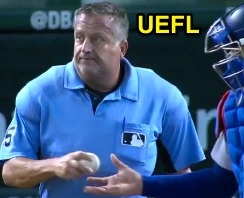 April 15-16: Nic Lentz is called up to serve as the crew's fourth umpire to complete the Toronto series. April 17-24: The crew either takes a vacation or is assigned to Replay Review duty in New York. April 25 - May 14: Stu Scheurwater is called up to fill in as the crew's fourth umpire, replacing Lentz. May 16-21: Joe West joins the crew to replace Brian Knight; Scheurwater remains onboard. May 22-24: Greg Gibson joins the crew to replace West/Knight; Scheurwater remains on the crew. As of May 24, there has been no status update given for Scott. The longest recent absence on the Major League staff belongs to Bruce Dreckman, whose 522 days between big league games spanned the entire 2016 season. Tim Welke retired at the conclusion of the 2016 season (though he announced his plans for retirement in March 2016), following knee replacement surgery. *Pursuant to CCS/UEFL Best Practices, any private information or rumors thereof gathered from information not available to the general public or media source thereof will not be disseminated in a CCS/UEFL-authored post. As specified in our Best Practices, "The 'Rumor' tag is reserved for operational information." The source for Scott's comments after his traumatic event last month was Harold Reynolds. This is not a discussion of Scott's current condition; please respect his privacy. this is a discussion of a crew working without a crew chief.